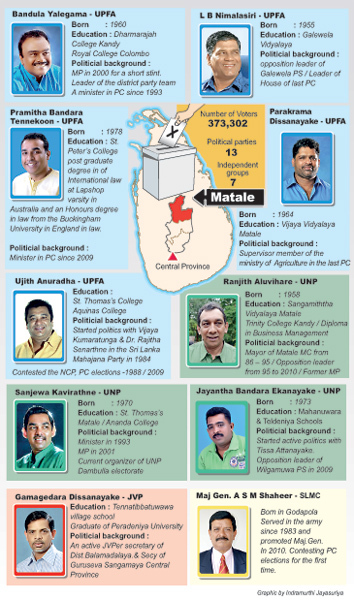 Campaigning for the first ever Northern Provincial Council (PC) elections is reported to be low key compared to the campaigning in the other two constituencies, North-Western and Central provinces. Though the campaign for the elections scheduled for September 21 is in its initial stage election monitoring groups say they have received reports of a number of election law violations including abuse of state resources, particularly the misuse of state-owned vehicles carrying fake vehicle number plates. There are also reports that some vehicles display stickers of candidates, violating regulations under the Motor Traffic Act. Campaign for Free and Fair Elections (CaFFE) has recorded 64 election related complaints out of which a majority is to do with misuse of state properties. CaFFE director Keerthi Tennakoon said many cardboard cutouts of candidates have been displayed in the Kandy District, mainly in Gampola and Nawalapitiya. 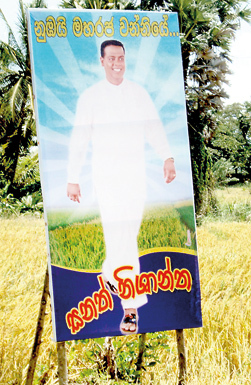 “There are a number of cutouts and posters displayed along the Gampola-Nuwara Eliya and Gampola- Pussellawa roads. A huge cutout along the Gampola-Peradeniya has not yet been removed,” he said. He added that he has received a number of complaints regarding illegal election propaganda taking place within the Kandy district. Commenting on the misuse of state vehicles he said there was evidence that vehicles which belong to the Uva Provincial Council were driven to Matale for campaigning purposes. Mr. Tennakoon claimed even state-owned buildings such as provincial council circuit bungalows were being used for election meetings in the North-Western Province. “In Kurunegala certain vehicles are covered with digital stickers of candidates. Although this is a violation of the Motor Traffic Act and complaints have been made to the Election Commissioners’s office these types of illegal activities continue,” he said. He said in the Northern Province the main complaints consisted of threats by armed forces. Meanwhile the People’s Action for Free and Fair Elections (PAFFREL) said it has recorded 26 complaints, five from the Northern Province, eight from North-Western Province and 15 from the Central . There have been three assaults reported due to intra-party violence in Kurunegala. PAFFREL director Rohana Hettiaratchchi said he had written to the Elections Commissioner to stop new appointments as that was against the election laws. He too stressed that the organization had received a large number of complaints regarding the misuse of state-owned properties. He said in the run up to the elections PAFFREL would be meeting assistant elections commissioners from all three provinces, the Deputy Inspectors General of Police (DIGs) and all government agents. He added too that PAFFREL would bring in foreign observers to monitor elections. Meanwhile parties were setting up district level election offices to carry on election work including preparing leaflets and drafting manifestos. The ruling party, United People’s Freedom Alliance (UPFA) General Secretary Minister Susil Premajayantha is in charge of the election campaign in the North while Minister Maithripala Sirisena is in charge of the North-Western Province and Minister Nimal Siripala the Central Province. Minister Premajayantha told the Sunday Times that branch level organisations and district offices were launched in Jaffna, Killinochchi, Mullaitivu, Mannar and Vavuniya, yesterday. He said that by the end of this month major meetings will be organised in all three provinces leading to major rallies. Sri Lanka Freedom Party (SLFP) Jaffna District Organiser and leading candidate in the candidate list, Angajan Ramanathan said he would launch his election manifesto on August 18. Developing the education sector, youth employment and empowerment, boosting livelihood such as farming and fishing similar to the years back in the 1970s and 1980s will be the focal points of the northern campaign manifesto of the UPFA, he said. “I will bring back the glory of Jaffna,” he said. Meanwhile main opposition party the United National Party (UNP) Parliamentarian D.M Swaminathan, chief organiser of the Northern Province said, that the UNP would not be challenging the Tamil National Alliance (TNA) at the upcoming polls. “We will only look at the political difference between the government and our party,” he said. “We will campaign for a political settlement to the problems of the people in the north and promise to regain the lands of the people in the Northern Province,” he said. TNA parliamentarian E. Saravanabavan, member of the campaigning committee said their party was holding pocket meetings. However, newspaper campaigns and campaigns by individual candidates were yet to get off ground. He said by next week the TNA would hold about 15 public meetings in all electorates. Meanwhile CaFFE said 22,000 people in the north have applied to obtain identification documents such as National Identity Cards (NICs) and other documents for voting purposes. “Earlier people in the north did not show much interest in elections but this time they are looking forward to make use of their voting rights to choose their representatives,” CaFFE Director said. However he added that more than 85,000 people in the north still did not have identification documents. Jaffna Elections Commissioner S.Achchudhan however giving a different picture said the people of Jaffna were showing very little interest in the upcoming elections. “We are hoping to address the people on the importance of using their voting rights,” he said. Some 435,263 voters from the North-Western Province, 1,889,557 from the Central Province and 714,488 from the Northern Province are eligible to vote in the upcoming polls.